Through its TAP Express regional brand, TAP Portugal has become an operator of Embraer’s E-Jets family. TAP is operating nine used Embraer 190s, making it the first Portuguese operator of Embraer E-Jets. Deliveries of Embraer 175s to Horizon Air will start in the second quarter of 2017 and the aircraft will fly exclusively for Alaska Airlines, Horizon’s Air’s sibling mainline carrier. Lufthansa Group subsidiary Austrian Airlines began using 120-seat Embraer 195s on scheduled services January 4 on routes linking its hub at Vienna Airport with Belgrade, Warsaw, Hamburg, Thessaloniki and Tirana, as well as other European destinations. On the first day of the Paris Air Show 2015, Embraer announced new orders from four customers for 50 aircraft of its E-Jet and E-Jet E2 families, as well as options and other commitments from two of the customers for 35 additional E-Jets. The contract, which Embraer values at US$1.1 billion at current list prices, makes HNA Tianjin Airlines the first Chinese airline to order aircraft from the Embraer E-Jets E2 family. Air France KLM group regional carrier KLM Cityhopper has placed a firm order for 15 Embraer 175s and two E190s. Its purchase contract also includes options for 17 additional E-Jets for KLM Cityhopper or Hop!, Air France’s regional subsidiary. Embraer says it will deliver the five aircraft, each of which will be configured with 76 seats in two cabin classes, in mid- 2016. Dallas/Fort Worth-based American Airlines has chosen Compass Airlines, a subsidiary of regional-airline holding company Trans States Holdings, to operate the first 20 Embraer 175s from American’s order. All will be operated under the American Eagle regional service brand. AeroMexico’s new E-Jet, an Embraer 190, is also the 200th aircraft from the E-Jet family flying in Latin America. On the same day, August 28, Embraer received both welcome and potentially unwelcome news from Japan Airlines concerning the manufacturer’s E-Jets and E-Jets E2 families. Two Chinese companies, Tianjin Airlines and ICBC Leasing, have signed orders and commitments for a total of up to 60 aircraft from the Embraer E-Jets and E-Jets-E2 families in deals valued at a total of $3.3 billion, during Chinese President Xi Jinping’s state visit to Brazil. Brazilian manufacturer Embraer has announced orders and commitments from two existing customers for eight more examples of its current E-Jets family, as well as revealing a new E-Jets operator. Embraer expects to complete negotiations over firming the firm, 30-aircraft part of the commitment from Azul by the fourth quarter of this year. The aircraft will be added to the manufacturer’s order backlog when the order is finalized. 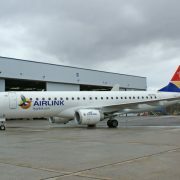 Guernsey-based regional carrier Aurigny Air Services will use the Embraer 195, its first jet airliner, to add capacity on its flagship route linking the island of Guernsey in the Channel Islands with London Gatwick Airport. 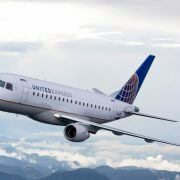 SkyWest Airlines, one of SkyWest Inc.’s two main regional-airline subsidiaries, will operate the aircraft for United Airlines under a United Express franchise agreement. Its Embraer 175s are to be configured in a dual-class 76-seat layout.